This entry was posted in Uncategorized and tagged Black & White Photography, Elliot Erwitt, Hiking, hudson valley ny, kimberly bridge parking area, Photography, picnics, ward pound ridge reservation, westchester county ny on August 10, 2018 by The Zen Hiker. ***With this hike I finally went over 100 miles for the summer. Woo Hoo!!!! Hopefully no more rain! 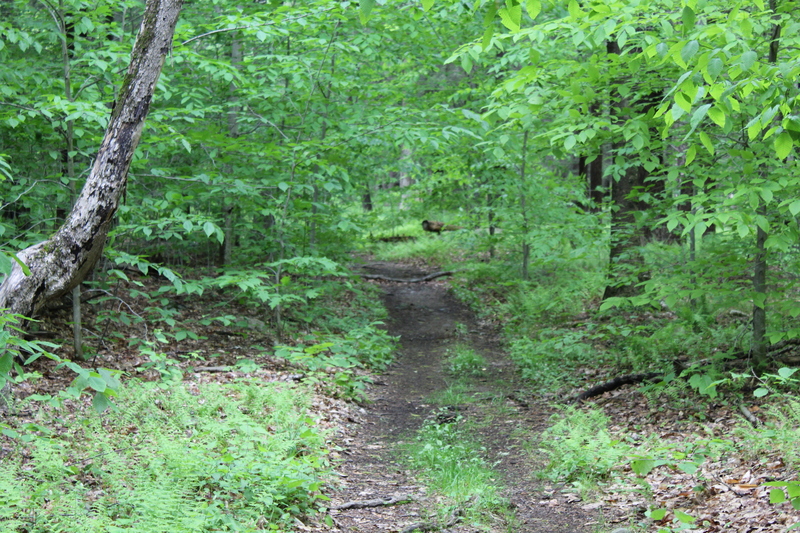 Just the other day I ventured onto the Blue Trail on the Ward Pound Ridge Reservation. I chose to tackle the trail in a counterclockwise manner and I am glad that I did. Although the trail was pretty steep at the beginning and had several demanding climbs and even more demanding descents, the last section of the trail was relatively flat. To get a better idea of the rest of the trails in the park, I purchased Walkable Westchester by Jane and Walt Daniels. This book gives detailed descriptions of trails in the parks in Westchester County, NY. Parking in the Kimberly Bridge parking area again, you actually stay on the parking lot side of the road to access the Brown Trail. Starting off on the DH trail, you follow that until it intersects with the Brown Trail. The Cross River just off of the Kimberly Bridge parking area. The DH Trail as it re-enters the woods. Shortly you will veer right onto the Brown Trail. As you begin hiking on the Brown Trail, it ascends quickly and steeply for a short time. As with the blue trail, unless you are looking for a hike with what seems like never ending climbing, you should do this in a counterclockwise direction. The Brown Trail moving to the right. After climbing, leveling off and then descending, the trail turns sharply to the left and with the exception of a very short climb, stays level or moves downhill for the rest of the hike. The hiking was easy on this portion of the trail. The Brown and the DH Trail stay together for a short time. One of the more interesting things about this hike is the varied terrain that you come across. Woods roads, forest, Cross River and now an almost tunnel like experience as you hike through this portion of the trail. A bridge connecting the Brown Trail with the FH Trail. The Cross River again, this time deeper in the woods. After completing the Brown Trail Loop, I crossed the street and hiked some more on the DH Trail until it came to Reservation Road. At this point I turned left and headed back to the parking area. This entry was posted in Uncategorized and tagged blue trail, brown trail, cross river, DH Trail, Hiking, Hudson Valley Hikes, Hudson Valley Hiking, Inner Peace, Jack Kerouac, jane and walt daniels, kimberly bridge parking area, peace, the dharma bums, tranquility, walkable westchester, ward pound ridge reservation, westchester county ny on August 13, 2017 by The Zen Hiker.